In what President Donald Trump called “a very big day for free and fair trade,” he and the leader of the European Union agreed Wednesday to work to end tariffs on nonautomotive products. 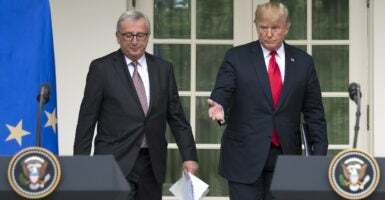 European Commission President Jean-Claude Juncker and Trump met at the White House, then went to the Rose Garden to announce not only a cease-fire but disarmament in what was turning into a trade war. The two leaders’ agreement included resolving the tariffs on steel and aluminum imposed by the Trump administration, which the EU has retaliated against. At this point, the audience, including several members of Congress, began to applaud. 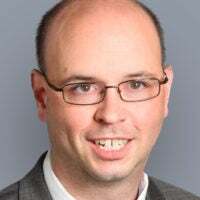 “The announcements today from President Trump and EU President Juncker were an encouraging first step to put the brakes on the trade war,” Tori Whiting, a trade economist at The Heritage Foundation who has written extensively on tariffs, told The Daily Signal in an email. The Rose Garden event was not initially on the president’s schedule, suggesting it was likely contingent on the outcome of talks between the two leaders. Trump said the U.S. and EU would work to reduce trade barriers and increase trade on chemicals, pharmaceuticals, medical products, and soybeans. Trump drilled down on soybeans after objections from farmers to several of the tariffs the administration has pushed. This will open markets for farmers and workers, increase investment, and lead to greater prosperity for both the United States and the European Union. It will also make trade fairer and more reciprocal—my favorite word—reciprocal. Trump and Juncker said the EU wanted to import more liquified natural gas from the United States, reform the World Trade Organization, and establish a joint working group to evaluate tariff measures. The two leaders agreed not to violate the spirit of the agreement before the final deal is reached. Neither leader took questions from reporters.